Bamz-Amschend is a hidden Dwemer ruin accessible from the Plaza Brindisi Dorom. Unbeknown to the leaders and citizens of Mournhold, beneath the Plaza Brindisi Dorom is hidden not the ruins of the old city but rather a massive Dwemer ruin, Bamz-Amschend. The ruins only become accessible after a surprise attack on the city destroys the Plaza's central statue, leaving beneath it an opening through the ceiling of the old fortress. 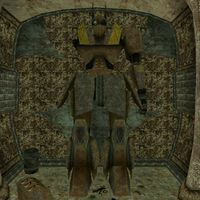 Bamz-Amschend is unique due to the fact that its architecture is remarkably different from any other Dwemer ruins encountered in the game. It has a much higher roof, completely different wall structures and supports, and also is the only ruin to contain Centurion Archers. Throughout Bamz-Amschend you will find piles of ash and pieces of armor and weapons, which may give clues to the disappearance of the Dwemer. This is the first room you will enter, accessed by a collapsed tunnel underneath the statue. When you arrive, there will be a battle already in progress between several Fabricants and some Dwemer constructs. They will both ignore you at first, so you might as well just sit back and watch them destroy each other, then clean up after one side wins (Usually the Dwemer). Make sure you loot any Dwemer Archers you find here and further in - their darts are among the best throwing weapons in the game, and can make short work of some of the more powerful opponents. The door to the right of the Hearthfire Hall leads to the Hall of Winds. This dead end set of rooms is notable only for the fact that it contains one Dwemer Satchel Charge, which will be needed later on (Though you will only ever need two of these, and there are two more found elsewhere). The left door from the Hearthfire Hall leads here. It's basically just a downward leading hallway, with one branch leading to the Hall of Wails, and the other going down to Radac's Forge. There is little to note here, as this area mainly serves as a hallway to separate other, more important halls. Almost identical to the Hall of Winds, there is pretty much nothing of note here beyond some assorted Dwemer loot. In one room here, you will see a giant Dwemer automaton under construction. Remember this room, as you will have to come back here later to meet the ghost of a long-dead Dwemer engineer. Outside this room, at the end of a long passage, is a collapsed wall leading to the next section. To get through, you will need a Dwemer Satchel Charge. Fortunately, there are two of them nearby in a chest in a closet (both locked). Set the Satchel down and back away before it blows, and it will open a crawl-space to the next section. This is a hallway leading down further to the King's Walk. To your right, shortly after you enter, there is another collapsed wall, which leads to the Daedric Shrine of Norenen-dur. Getting into the Passage of the Walker requires a Dwemer Satchel Charge (see section above). This room houses the Dwemer weather machine. You will need a Powered Dwemer Coherer to activate it - Almalexia will provide you with one. Once it is active, you can use the three levers there to change the weather over Mournhold. A large rotating wall with carved images will indicate to you what the current weather is. Bamz-Amschend was mentioned in the book Chronicles of Nchuleft. Bamz-Amschend also appeared in The Elder Scrolls Online, although it is titled "Clockwork City Vaults". This page was last modified on 24 April 2019, at 23:23.